Another presentation from Scott, this time over breakfast. The bulk of this talk was focused on the importance of what he termed as “Next State Architecture.” If we have the future state and current state architectures documented, the challenge that exists is if we can’t achieve the future state architecture in one step. If that’s the case, then there’s a gap in the prescriptive guidance needed for project teams. If they know they can’t get to the future state, and don’t have guidance on how they should move from current state, they’re likely to stick with what they know. Good advice. There were some specific nuggets outside of this core topic that I also wanted to call out. First, he said that the most important EA deliverable is principles, because it’s those principles that lead to consistent decision making. The talk wasn’t focused on this, so he didn’t go into depth, but some examples of these principles would be good. I definitely see the importance in these and agree with his statement. I’ve been in many situations with two (or more) compelling options where we seem to be at a stalemate. The principles need to assist in getting decisions made. Second, I liked the fact that he said that EA’s role is to provide prescriptive guidance so that appropriate choices are made on projects and programs. This emphasizes the point that I was hoping would be made in his governance talk yesterday. Provide the policies, and anyone can make the right decisions. Finally, the last comment he made was that with the advent of EA-focused web sites, etc., any team that claims ignorance when confronted with non-compliance (“I didn’t know I was supposed to do that”) is unacceptable in this day. Here, I disagree. I make extensive use of RSS feeds in my work so that I get information pushed to me, but I know many of my colleagues do not. A web site is still a pull-model, and there’s very few people that I know of that have the discipline to regularly check common web sites. EA has to be accountable for the communication effort and ensuring that it gets pushed out to the people who need it. Putting it on a web site isn’t enough. So, this one I disagree with. I think if EA is serious about achieving compliance, then they should be serious about pushing the information out. Create a formal communication plan and execute it. This presentation got me on my soap box. This talk took the traditional approach to governance, framing it around decision rights. In my opinion, this is too narrow of a scope and leads to the typical review board approach that contributes to the negative connotation most project staff have around governance. A focus on decision rights always jumps to some kind of an exception process, or better stated, a situation where there is a project that is not compliant with the architecture. The problem I have with this view is that these decisions assume that the project was knowingly out of compliance. More often than not, I don’t think that’s the case. I think the project team isn’t aware of what “in compliance” is, makes decisions based upon their knowledge and context, and only when (and if) someone else who has some other context comes into the picture, does a discussion around “decision rights” even enter the mix. When that happens, it’s usually too late in the project, and the schedule wins. What’s the real source of the problem here? It’s not a problem with decision rights, it’s a problem with not providing the people making the decisions the knowledge they need to do it right. What’s even worse in that if we didn’t even find out about the non-compliance, the focus is misplaced on inserting a checkpoint/review instead of actually getting the project team to make the right decision to begin with. Put another way, how fast would you drive on a road that has no speed limit signs posted? If everyone was speeding, is the right answer to put police officers out there every mile, or is the right answer to post speed limit signs. Unfortunately, with projects, we’re doing the former. We stick more police out in the form of big review boards, but we still haven’t bothered to give the teams the information they need to do things right. Instead of focusing on who has authority, focus on what the policies are that state what the “right” thing to do is, and enable the people that are must make the decisions to make them properly, rather than taking away their ability to make decisions by requiring them to guess which decisions must be escalated up the ladder to the person who is deemed the authority. The person who is the authority shouldn’t be making decisions, they should be making policies and enabling the decision makers. The session is now over, and I want to point out that his recommendations slide did have a bullet point encouraging lots of proactive communication on the architecture. I also want to add that there was good content in the presentation, especially the brief discussion on federated governance across business units near the end, I just wish he had emphasized his recommendation on proactive communication (and introduced the concept of policy as part of that) in the earlier slides instead of so much focus on review boards and waivers. I caught him after the presentation and told him about my book, hopefully we can continue the conversation. He’s not on Gartner’s blogroll yet, so I’ll have to hope for some offline communication on the topic. In this session, Bernadette Rasmussen, Chief Enterprise Architect at Health Care Service Corporation, gave a case study discussing their efforts to establish a future-state architecture. The highlight of this session for me was the fact that a deliverable of their future state architecture was a formal communication plan, and then the actual communication activities articulated in that plan. This included large presentations for lots of people, DVDs containing an overview, development of on-line training, formal communication to senior IT leadership (who in turn had them communicate it senior leadership outside of IT), and more. I’ve had the opportunity to work on one enterprise-level effort with someone who was passionate about communication and had us develop a similar plan, and I think it was a huge contributor to the success of the effort. Developing the artifacts is one thing, but if people don’t know they exist, they won’t get used. Al discussed Allstate’s journey on the path to establishing a business architecture practice at Allstate. Two highlights that I wanted to call out. First, he’s emphasized the need for an engagement model. I’ve seen too many teams, whether formally on the org chart or not, that don’t have an idea on how either the team members or the artifacts that they may create will be utilized within project efforts. In the IT organizations I’ve seen, the work gets done in projects, period. Architecture teams that don’t have people formally allocated to projects need to figure out how their artifacts and/or staff will be utilized in those projects. Second, he emphasized the need for business architecture in making solid project decisions. I couldn’t agree more, and have a chapter discussing this in an SOA context in my book. In the context of SOA, one question that gets asked is “How do I build the right services?” Asking this question after a project has been initiated is already problematic as the project establishes scope boundaries, and changing those requires more effort than it would have if those discussions were had during the project definition process. I will be at the Gartner EA Summit in Vegas on Thursday the 11th and Friday the 12th, including being a panelist on EA and SOA on Friday morning. Introduce yourself to me there and perhaps you will get a discount code for my book. Offer open to attendees only. The idea of context-driven architecture, as coined by Gartner, has been bouncing around my head since the Gartner AADI and EA Summits I attended in June. It’s a catch phrase that basically means that we need to design our applications to take into account as much as possible of the context in which it is executed. It’s especially true for mobile applications, where the whole notion of location awareness has people thinking about new and exciting things, albeit more so in the consumer space than in the enterprise. While I expect to have a number of additional posts on this subject in the future, a recent discussion with a colleague on Data Warehousing inspired this post. In the data warehousing/business intelligence space, there is certainly a maturity curve to how well an enterprise can leverage the technology. In its most basic form, there’s a clear separation between the OLTP world and the DW/BI world. OLTP handles the day to day stuff, some ETL (extract-transform-load) job gets run to put it into DW, and then some user leverages the BI tools to do analytics or run reports. These tools enable the user to look for trends, clusters, or other data mining type of activities. Now, think of a company like Amazon. Amazon incorporates these trends and clusters into the recommendations it makes for you when you log in. Does Amazon’s back-end run some sophisticated analytics process every time I log in? I’d be surprised if it did, since performing that data mining is an expensive operation. I’m guessing (and it is a guess, I have no idea on the technical details inside of Amazon) that the analytics go on in the background somewhere. If this is the case, then this means that the incorporation of the results of the analytical processing (not the actual analytics itself) is coded into the OLTP application that we use when we log in. So what does this have to do with context-driven architecture? Well, what I realized is that it all comes down to figuring out what’s important. We can run a BI tool on the DW, get a visual representation, and quickly spot clusters, etc. Humans are good at that. How do you tell a machine to do that, though? We can’t just expect to hook our customer facing applications up to a DW and expect magic to happen. Odds are, we need to take the first step of having a real person look at the information, decide what is relevant or not with the assistance of analytical tools. Only then can we set up some regular jobs to execute those analytics and store the results somewhere that is easily accessible by an OLTP application. In other words, we need to do analysis to figure out what the “right” context is. Once we’ve established the correlation, now we can begin to leverage that context in a way that’s suitable for the typical OLTP application. So, if you’re like me, and just starting to noodle on this notion, I’d first take a look at your maturity around your data warehousing and business intelligence tools. If you’re relatively mature in that space, that I expect that a leap toward context-driven applications probably won’t be a big stretch for you. If you’re relatively immature, you may want to focus on building that maturity up, rather than jumping into context-driven applications before you’re ready. This is my last post from the summits (actually, I’m already at the airport). This morning, I participated in a panel discussion on EA and SOA as part of the EA Summit with Marty Colburn, Executive VP and CTO for FINRA; Maja Tibbling, Lead Enterprise Architect for Con-way; and John Williams, Enterprise Architect from QBE Regional Insurance. The panel was jointly moderated by Dr. Richard Soley of the OMG and SOA Consortium and Bruce Robertson of Gartner. It was another excellent session in my opinion. We all brought different perspectives on how we had approached SOA and EA, yet there was some apparent commonalities. Number one was the universal answer to what the most challenging things was with SOA adoption: culture change. There were a large number of questions submitted, and unfortunately, we didn’t get to all of them. The conference director, Pascal Winckel (who did a great job by the way), has said he will try to get these posted onto the conference blog, and I will do my best to either answer them here on my blog or via comments on the Gartner blog. As always, if you have questions, feel free to send them to me here. I’d be happy to address them, and will keep all of the anonymous, if so desired. I just attended a case study at the summit. The presenter requested that their slides not be made available, so I’m being cautious about what I write. There was one thing I wanted to call out, which was that the case study described some application portfolio analysis efforts and mapping of capabilities to the portfolio. I’ve recently been giving a lot of thought to the analysis side of SOA, and how an organization can enable themselves to build the “right” services. One of the techniques I thought made sense was exactly what he just described with the mapping of capabilities. Easier said than done, though. I think most of us would agree that performing analysis outside of the context of a project could provide great benefits, but the problem is that most organizations have all their resources focused on running the business and executing projects. This is a very tactical view, and the usual objection is that as a result, they can’t afford to do a more strategic analysis. It was nice to hear from an organization that could. One thing all of the presenters in the EA Summit are very good at doing is using consistent diagrams across all of their presentations. This is at least the third presentation where I’ve seen this flow diagram showing linkage between business goals and strategy, and business planning and execution. Unfortunately, Anne points out that the linkage is where things typically break down. Colleen is now discussing strategic integration, which begins with an actionable articulation of business strategy, goals and objectives. From there, she recommends a standardized, integrated, results-based management methodology. As a result, she claims that we will see exponentially greater benefits from enterprise capabilities and investments. Anne is speaking again and emphasizing that we need a unified contextual view. This consists of a goal, which is one level deeper than the “grow revenues by XY%” which includes a future end state with a timeline and measurable targets, principles that establish the desired behavior and core values, and relationships. Colleen now has a great slide up called, “The Implication of ‘Implications’.” The tag line says it all- “Unclear implications lead to inconsistent assumptions and independent response strategies that inevitably clash.” Implications that must be investigated include financial implications, business process implications, architecture implications, cultural change implications, and more. All parties involved must understand and agree on these implications. A statement Colleen just made that resonates with my current thinking is, “Based upon these implications, what do I need to change?” All too often, we don’t stop to think about what the “change” really is. Work starts happening, but no one really has a clear idea of why we’re doing it, only an innate trust that the work is necessary and valuable. If the earlier planning activities have made these goals explicit, the execution should be smoother, and when bumps in the road are encountered, the principles are right there to guide the decision making process, rather than on relying on someone’s interpretation of an undocumented implication. Once again, this was a good session. I know I’ve commented on a few sessions that they could have been a bit more pragmatic or actionable, this one definitely achieved that goal. I think the attendees will be able to leave with some concrete guidance that they can turn around and use in their organizations. The first topic Richard is covering is the need for enterprise architects to master strategic thinking. His current slide is consistent with an earlier talk today, showing that enterprise strategy is at the intersection of three disciplines: Enterprise Strategy and Planning, Enterprise Architecture, and Enterprise Portfolio Management. 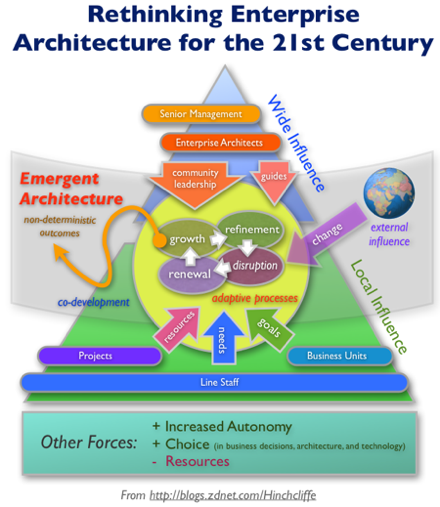 He states that enterprise architecture must translate business vision and strategy into effective enterprise change. He’s discussing how a budget and the organization chart are not part of the business strategy, pointing out that a budget should be a downstream deliverable derived from the business strategy. Great point. His definition of strategy includes an organization’s environment, goals, objectives, major programs of action, and the resource allocation choices to execute them. The next topic he is covering are the categories of tools and techniques that are used in developing a business strategy. These are not software tools, as the first one he’s showing is Porter’s 5 Forces Model (this is second time Michael Porter has been referenced at the Summit). He’s challenging us to go and find the people in our organization that are looking at these things. Good advice. There’s no doubt that if you want to do strategic planning, you need to be looking at these five forces, and there’s a good chance that someone at the company (probably outside of IT) is already doing this. The same thing holds true for the other categories of tools that he has went through. The final point he’s covering is how to leverage these strategic tools within the EA process. To some extent this is motherhood and apple pie, but it’s very good advice, especially knowing that many EA’s have grown out of the world of application development and may still be very technology focused. As a result, it’s entirely possible that the EA team has never read the company’s annual report. It’s even more likely that EA hasn’t seen things like competitive analysis documents. If an EA doesn’t understand how a company competes, how can they make appropriate decisions? Speaking very broadly and citing Michael Raynor’s earlier presentation, do you know whether your company differentiates on cost or on products? Both of those can have significant impacts on how information technology is leveraged. A company that differentiates based on product excellence and customer service must have significantly better technology for understanding their customers than a company that simply tries to be the lowest cost provider in the marketplace. I’m looking forward to this talk, as it’s a new area for me. I don’t remember who told me this, but the key to getting something out of a conference is go to sessions where you have the opportunity to learn something, and you’re interested in the subject. That’s why I’m avoiding sessions on establishing enterprise technology architects. I’ve been doing that for the past 5 years, so the chances are far less that I’m going to learn something new than in a session like this one, where it’s an emerging space and I know it’s something that is going to be more and more important in my work in the next few years. The only downside is I’m now on my fourth day in Orlando which is starting to surpass my tolerance limit for sitting and listening to presentations. He’s started out by showing that the thing missing from the digital experience today is “me.” By me, he implies the context of why we’re doing the things that we’re doing, such as “where am I,” “what have I done,” “who are you talking to,” etc. He points out the importance of user experience in the success and failures of projects, especially now in the mobile space. Blending of personal contexts and business contexts. For example, just think of how your personal calendar(s) may overlap with your business calendar. Managing Technical Contexts: What device are you using, what network are you connecting from, etc. and what are the associated technical capabilities available at that point? Context timing: The context is always in a state of flux. Do I try to predict near-term changes to the context, do I try to capture the current context, or do I leverage the near-past context (or even longer) in what is shown? It’s always a sign of a good presentation when they anticipate questions an audience might ask. I was just about to write down a question asking him if he thinks that a marketplace for context delivery will show up, and he started talking about exactly that. This is a really interesting space, because there’s historical context that can be captured and saved, and there’s an expense associated with that, so it makes sense that the information broker market that currently selling marketing lists, etc. will expand to become on-demand context providers with B2B style integrations. All in all, I see this space with parallels to the early days of business intelligence. The early adopters are out there, trying to figure out what the most valuable areas of “context” are. Unlike BI, there are so many technology changes going on that are introducing new paradigms, like location aware context with cellphones, there’s even more uncertainty. I asked a question wondering how long it will be before some “safe” areas have been established for companies to begin leveraging this, but his answer was that there are many dimensions contributing to that tipping point, so it’s very hard to make any predictions. This was a good presentation. I think he gave a good sampling of the different data points that go into context, some of the challenges associated with it, and the technical dynamics driving it. It’s safe to say that we’re not at the point where we should be recommending significant investments in this, but we are at the point where we should be doing some early research to determine where we can leverage context in our solutions and subsequently make sound investment decisions.